Heavy Duty High-Rider western cartridge belt with shell loops. Shell loops are sized for .38/.357 caliber ammunition. 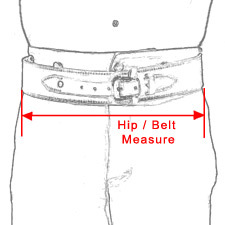 This style of belt also offered in .22 and .44/.45 cal options. Produced in Mexico by skilled craftsmen, this south-of-the-border original evokes the spirit of the 1800's Southwest. No problem with fit on hips ,at all, nice quality leather, the holster also fit perfect, very fast delivery, you can't go wrong with this. Exactly what was offered and what I wanted. These belts are nice but the marked sizes are not anywhere near accurate. First (38) one couldn't even be attached to the first hole. Returned it and the second one (42), even on the tightest setting fell off. The third one (40) required being on the tightest hole, even then it was a little loose. I had to punch an additional hole. I would not recommend buying these belts, even though they are well made, because you are taking a chance on fit, and you will pay lots of shipping charges back and forth. I have many belts and this is the worst purchase I've made in a long time. I received a stiff cardboard like item that I have had modified to use. I have 3-4 belts of the same size from others that fit while this one is at the shop being lengthened by 2 full notches. I bought a "service belt" that will have its notched end used to replace the one on the belt from HE. I'd rather make it of some use than send it back. I haven't tried to put shells in the loops, but wonder what it will be like when I pick it up today. This belt was one of two items I ordered for my Colt Navy .38 w/7.5" barrel and I just think it's size was stamped wrong. It is a good belt for the price. I did have a problem with the fit as the middle hole of the billet is not the size of the belt ordered which was disapointing as I was told how they are sized when I called and placed my order. Excellent item, product was as stated. Nice belt. Excellent value. I have a 33" waist and ordered a 36" belt (way too small) The exchange was quick and painless. I received my 42" belt quickly and was a perfect fit. I have ordered multiple items and have NEVER been disapointed. Thank You all for the wonderful job you do. Works great, and the service and cooperation of the staff (Eve) was fantastic! Anyone looking for unique shopping items should shop the Historical Emporium. They have so many unique items. Their Customer Service is second to none. I would refer them to anyone. This outfit was ordered for my wife. I forwarded your survey to her. She may or may not complete it. However, I think it looks great on her. The real test will be when she wears it to the Annapolis Valley International Town Crier Competition in Nova Scotia next week. We will take pictures then. The red/black combination is in Brantford's City colours and works very well with my Town Crier uniform.